This sounds so summery! I love the idea of making a cake with cornmeal, I bet it gives it a great texture. I definitely want to make this one! Thanks! The amount of cornmeal was just enough to give the cake some texture without being too crunchy or dry. Hope you get a chance to try it! HI Genevieve! Thanks for linking this up to HVF...it looks fantastic! 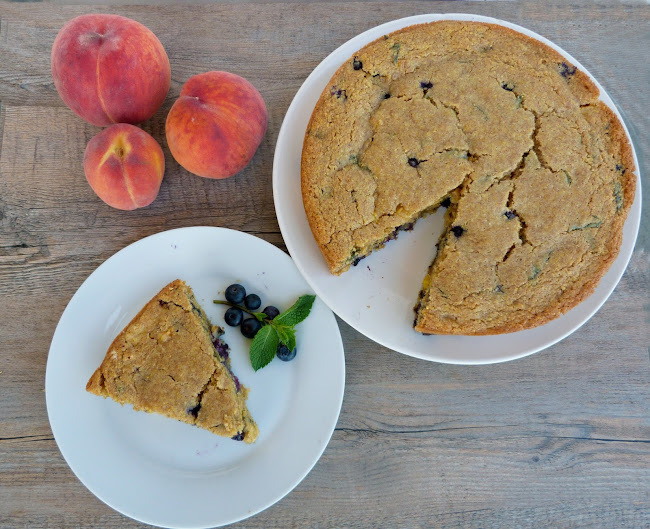 I love using cornmeal in cake like this because it adds so much great texture and a slight hint of corn taste that is so fitting for summer! And blueberrie, peaches and mint are such a great combo! Loving this! Thanks Shelby! I thought it was such a nice combo for late summer too. I've been eating so much corn lately and I love it! Mmmmm mouthwatering! I love adding fresh herbs to my baked goods - they add such an interesting component. Love what you did with this cake! Thanks! 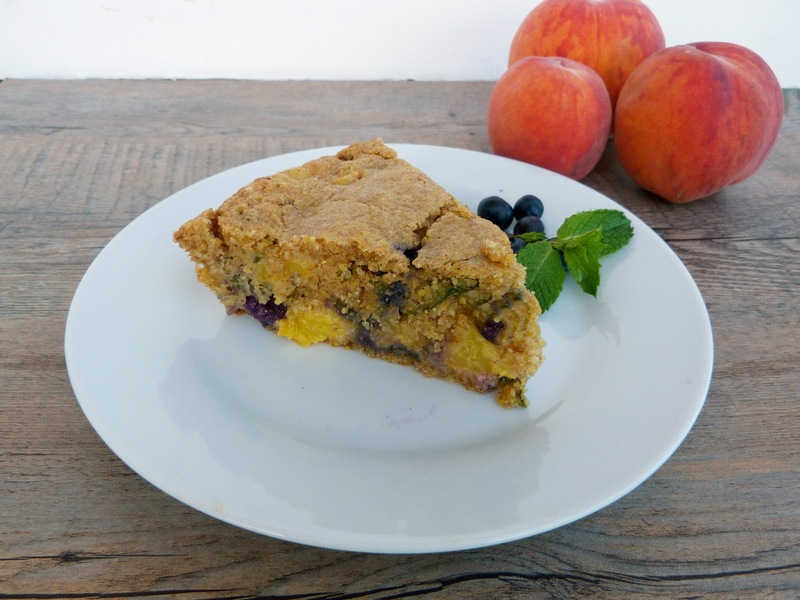 I knew herbs go well in savory baked goods like regular cornbread, so it was fun to try adding them to a dessert! I'd love to try it with basil too! Mmmmm! Love that you added mint to the cake! I'm obsessed with adding mint to things lately! 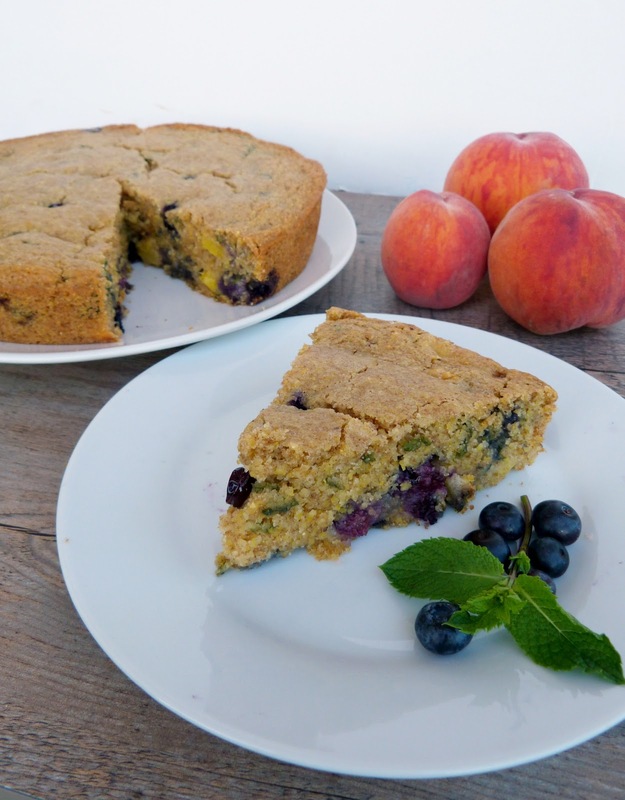 I also love that you added cornmeal into the cake to add texture and sweetness. I think I'll make this cake for my mom. She would love this! This looks really great and I am definitely going to try it! I noticed though that your recipe says 2 tsp baking powder and then 1/2 tsp baking powder. I'm guessing that one of those is supposed to be baking soda but I'm not sure which one. Can you clarify? Thanks for catching that error! I've fixed it now - the 1/2 tsp should be baking soda. I hope you like the cake! Great! Thanks for replying so quickly! I really wanted to make this today and now I can!